Mural @ Fresh Paint Gallery, Montreal Canada. Medium: Latex and acrylic on canvas and wall. About: I wanted to create giant illustrations using the walls and floor as my canvas. I brought a 3d aspect to the space by painting the female faces on top of three canvases previously mounted on the wall. About: Over the last 4 years I have been offering graffiti and street art workshop at a beautiful art summer camp for kids called Long Bay Camp. Over the period of 6 days the kids get to learn and create different designs and illustrations on various mediums such as t-shirts canvas and wood. In these workshops, we explore the concept of typography, illustrations and designs of various types of letters. - what makes a person an artist? Is it their creativity, their passion, their knowledge? Can anyone be an artist? - Why is art such a great alternative outlet for young people to express their creativity and learn about themselves? - Explained my struggle through some aspects of school and how art helped me discover who I am as a person. Documentary (in french): Xpression Graffiti is a 12 episode documentary that connects graffiti and the urban art culture in relation to our society, general and youth education and art. About: In 2012, I was ask to be part of a documentary that connected graffiti and street art to art education and community work. I was asked to elaborate on the importance of art in education and how the graffiti workshop created by Le programme Graffiti was able to help teenagers escape their everyday life to create an imaginary one with their new found skill. For the occasion, the filming crew documented a skateboard workshop at our office in Lachine and interviewed some of the kids there about their involvement in the workshop and the impact it had in their lives. Medium: Wheat Paste, Prints and spray can on walls. About: Artistic director Justin R. Saunders and I were commissioned to create and embellish the Adidas Creative office @ SidLee in Montreal. The idea was to wheat paste reproductions of my watercolour illustrations in giant format, while Justin spray-painted typography in connection to my work. 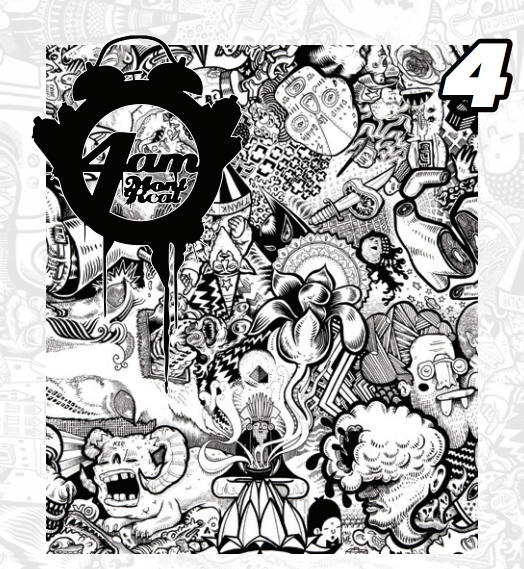 About: The 4am Magazine was created by Le Programme Graffiti and a young group of youth from Lachine in 2010. It documents the cultural and graffiti events in Montreal and abroad as well as highlights different artists and individuals that help to keep the culture alive in the city. About: TYPEFACE is a carefully crafted series of illustrations representing each letter of the alphabet. This drawing style is inspired by art nouveau, mangas, and tattoo designs.